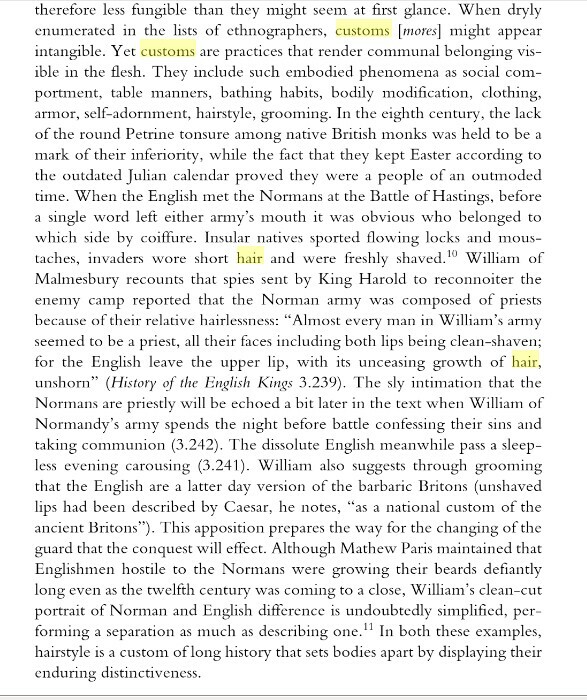 History of the conquest of England by the Normans [tr. by C.C. Hamilton]. The first public act of Hardicanute, after his accession, was to command the disinterment of the body of Harald, and that, after cutting off the head, his body should be thrown into the Thames. Godwin, whose power and whose designs were an object of fear and suspicion, was the first to be arraigned ; he appeared, and, according to the usages of the Anglo-Saxon laws, was accompanied by a great number of his kinsmen, friends, and witnesses in the cause, who, like himself, swore that he had taken no part, directly or indirectly, in the death of the son of Ethelred. This legal proof did not suffice with a king of foreign birth, and to render it valid it was necessary for the English chief to accompany it with rich presents, the detail of which, if not fabulous, would incline us to believe that the Saxon was assisted by many of his countrymen in purchasing the relinquishment of this prosecution, instituted in bad faith. In general Hardicanute showed, with respect to the vanquished people, less of cruelty than of avarice: his avidity surpassed even that of the piratical adventurers who were his forefathers. He oppressed England with tributes and his tax gatherers more than once fell victims to the hatred and despair which they excited. The citizens of Worcester killed two of them who were exercising their odious functions. So soon as the report of this murder was carried to the Danish authorities, two chiefs of that nation, Leofrik and Siward, the former of whom commanded in Murcia and the other in Northumbria, united their forces, and marched against the rebellious city, having orders to destroy it by fire and sword. The inhabitants left their houses in a body, and fled to one of the islands formed by the Severn, where they entrenched themselves, and resisted until they wearied the assailants, who left them at liberty to return, without further molestation, to their habitations that had been set on fire. Alfred Atheling or Aetheling was the son of Aethelred II and his second wife Emma of Normandy. He was a brother of Edward the Confessor. King Canute became their stepfather when he married Aethelred's widow. He and his brother were caught in the power struggles at the start and end of Canute's reign. Sweyn Forkbeard - (Old Norse: Sveinn TjÃºguskegg; d. 3 February 1014) was king of Denmark and England, as well as parts of Norway. His name appears as Swegen in the Anglo-Saxon Chronicle. He was the son of King Harald Bluetooth of Denmark. He was the father of Cnut the Great. After a long effort at conquest, and shortly before his death, in 1013 he became the first of the Danish Kings of England. His son Cnut and grandsons Harold Harefoot and Harthacnut ruled England for 26 years. After Harthacnut's death, the English throne reverted to the House of Wessex. Sweyn's descendants through his daughter Estrid continue to rule Denmark to this day. One of his descendants, Margaret of Denmark, married James III of Scotland, introducing Sweyn's bloodline into the Scottish Royal blood line. After James VI of Scotland inherited the English throne in 1603, Sweyn's ancestry was introduced into the English royal bloodline as well. Nearly four years ago, I began writing a novel, set in the aftermath of the Norman conquest of 1066. Before I began to write, I spent six months sitting in the Bodleian library poring over books and journals to familiarise myself with the period. I soon realised that, apart from the story of the Battle of Hastings that everyone learns at school, I knew hardly anything about the impact of the conquest. I began to understand, too, how much of that impact is still with us. By the end of the process, I had come to a slightly disquieting conclusion: we are still being governed by Normans. Take house prices. According to the author Kevin Cahill, the main driver behind the absurd expense of owning land and property in Britain is that so much of the nation's land is locked up by a tiny elite. Just 0.3% of the population â€“ 160,000 families â€“ own two thirds of the country. Less than 1% of the population owns 70% of the land, running Britain a close second to Brazil for the title of the country with the most unequal land distribution on Earth. Much of this can be traced back to 1066. The first act of William the Conqueror, in 1067, was to declare that every acre of land in England now belonged to the monarch. This was unprecedented: Anglo-Saxon England had been a mosaic of landowners. Now there was just one. William then proceeded to parcel much of that land out to those who had fought with him at Hastings. This was the beginning of feudalism; it was also the beginning of the landowning culture that has plagued England â€“ and Britain â€“ ever since. The dukes and earls who still own so much of the nation's land, and who feature every year on the breathless rich lists, are the beneficiaries of this astonishing land grab. William's 22nd great-granddaughter, who today sits on the throne, is still the legal owner of the whole of England. Even your house, if you've been able to afford one, is technically hers. You're a tenant, and the price of your tenancy is your loyalty to the crown. When the current monarch dies, her son will inherit the crown (another Norman innovation, incidentally, since Anglo-Saxon kings were elected). As Duke of Cornwall, he is the inheritor of land that William gave to Brian of Brittany in 1068, for helping to defeat the English at Hastings. The land grab was not the only injustice perpetrated by the Normans that has echoed down the centuries. William built a network of castles with English slave labour from which he controlled the rebellious populace by force. This method of colonisation and control was later exported to Ireland, Scotland and Wales, as the descendants of the Norman kings extended their empire from England to the Celtic nations. They taxed the poor harshly (the Domesday book is a tax collector's manual), deepening rural poverty to enrich royal coffers which were used to fight the continental wars that ravaged medieval Europe. Not without justification has one historian referred to Norman rule as a system of "medieval apartheid". Questions like this can never be answered. But I think it's worth noting that in 2012, as in 1066, the ruling class still drink wine while the "plebs" drink beer, much of the country remains the property of a few elite families and the descendants of the Normans remain wealthier than the general population. Meanwhile, the nation as a whole is paying the price for the rapacity of a wealthy elite which feels no obligation to its people. But it's worth noting something else too. The Norman conquest spurred a decade-long campaign of underground resistance by guerrilla bands across England â€“ a story that is largely forgotten now. The Normans called these rebels the "silvatici" â€“ the men of the woods, or the wild men â€“ and they proved as hard to defeat as guerrilla fighters always are. Though the Normans were never expelled, the spirit of the silvatici can be traced throughout later English history, from the Peasants' Revolt to the tales of Robin Hood. Not everyone takes conquest lying down. Today's elites might like to take note. I was just reading your post on the difference between â€œunalienableâ€� and â€œinalienableâ€�. I found it quite interesting. I was also reading an article about President Obama omitting â€œCreatorâ€� when quoting the Declaration ( http://www.wnd.com/index.php?fa=PAGE.view&amp;pageId=237349 ) when I noticed that he repeatedly uses â€œinalienableâ€�. The omission of the one word and the incorrect usage of the other in numerous instances can only be intentional. Heâ€™s very consistent about it. I was curious about your thoughts on this. Prior to our Declaration, the nations of the western world were governed by monarchies where only one manâ€”the kingâ€”was deemed to be sovereign. The king was sovereign because he, and he alone, was deemed to have been directly endowed by the God of the Bible (the earthly kingâ€™s â€œCreatorâ€�) with the â€œdivine right of kingsâ€�. That endowment of God-given rights did not attach as a result of an election or human appointment. That endowment attached as the result of a â€œcoronation ceremonyâ€� that took place in the highest church within the nation. The king would wear a crown of gold and jewels which was intended to symbolize the glittering â€œcoronaâ€� seen around the heads of the Christ and saints in medieval paintings. The crown didnâ€™t simply represent the kingâ€™s secular or political authority; it represented his spiritual authority. Because the king, and only the king, got his rights directly from God, the king had a special spiritual status (sovereignty) that no other man living in that kingdom could match. We can see some confirmation of these observations in the rules of chess and the design of classic chess pieces. In the classic chess piece design, the king alone has a cross on the top of his crown. That cross symbolizes that the king is directly â€œendowed by his Creatorâ€� with the â€œdivine right of kingsâ€� and is therefore sovereign. Under the rules of chess, you can â€œkillâ€� (remove from the chess board of â€œlifeâ€�) all of the other pieces. If an opponent lands on a pawn, knight, bishop, rook or queen, that piece is effectively â€œkilledâ€� and removed from the board. But the opponent can never â€œkillâ€� the king. You can checkmate the king by putting him in circumstances where he is both threatened with â€œdeathâ€� and unable to move to another, safer location. You can even accidentally put the king in a circumstance where he is not â€œin checkâ€� (being directly threatened) but canâ€™t move without moving into â€œcheckâ€� (death). The king, and king alone, had the â€œdivine right of kingsâ€�â€”which included an unalienable Right to Life. You could capture a chess king, but you could never, never, lawfully â€œkillâ€� him. The king in a monarchy enjoyed the â€œdivine right of kingsâ€� because the source of his rights was â€œdivineâ€�; i.e., the God of the Bible. He was sovereign because he alone received his rights directly from God. All else were subjects because they did not receive their rights directly from their Creator/God. I cannot overemphasize the significance of God-given rights. Those who have rights given them directly by God are sovereigns. Those who do not have such rights are subjects. So far as I am currently able to understand, the attribute of God-given rights goes to the very heart of our spiritual struggle with tyranny in general and our current government, in particular. This attribute explains why President Obama refuses to mention our â€œCreatorâ€� or â€œunalienable Rightsâ€�. It explains why modern government has twisted the â€œseparation of church and stateâ€� from a concept designed to protect the church from the â€œstateâ€� to a principle designed to protect the â€œstateâ€� from the church. It may seem odd to some that Iâ€™m repeating myself; that Iâ€™m again offering the text of the second sentence of the Declaration. But I might reproduce that sentence a third time in this articleâ€”or maybe four or five times. Why? Because once you really grasp the spiritual significance of that single, 35-word sentence, you will have taken the first, concrete step towards regaining your Liberty and reducing the size and power of our current government. You might not think so just yet but, in truth, you canâ€™t get enough of the Declarationâ€™s second sentence. Itâ€™s that important. Because the â€œdivine right of kingsâ€� found in monarchies and bestowed on just one man or woman per nation, corresponds to the â€œunalienable Rightsâ€� with which, under our Declaration, â€œall menâ€� are â€œendowed by their Creatorâ€�. The God-given, â€œunalienable Rightsâ€� elevated you and me from the status of subjects to the status of sovereigns. As subjects (without rights from our Father YHWH Elohiym), we must obey any and every rule, regulation, law and arbitrary decree of government. As sovereigns (endowed by our Creator with certain unalienable Rights), the government has only those limited powers over us which we (as individual sovereigns) granted to the government in our state and federal constitutions. Otherwise, government canâ€™t lay a glove on usâ€”unless we have injured or damaged another sovereign and that sovereign invokes both the powers of our servants (the government) and a jury of our peers (co-sovereigns) to decide what punishment, if any, should be imposed upon the defendant-sovereign. There is no Liberty without the unalienable Rights. There are no unalienable Rights except through the God of the Bible. Ergo, there is no Liberty without God. If youâ€™re a satanist or an atheist, youâ€™re screwed. You have no hope of Liberty. You will necessarily be a subject all of your life. By your choice to eschew the â€œunalienable Rightsâ€� given by the God of the Bible, you will have chosen to abandon any hope of ever being free. You will be a life-long subject in a secular world where might (not God) makes right. There is no other political or spiritual ground for claiming your unalienable Rights to Life, Liberty and the pursuit of Happiness (freedom of religion)â€“except the God of the Bible. If youâ€™re unable or unwilling to claim the unalienable Rights granted by the God of the Bible, youâ€™ll will live your life as a slave. If your choice of faith denies the God of the Bible, you will live your life as a slave. The â€œland of the freeâ€� cannot exist without the God of the Bible. Which is exactly why President Obama and others of his ilk insist on trying to eradicate the peopleâ€™s memory of the spiritual foundation for this country by not expressly referencing our â€œCreatorâ€� or â€œunalienable Rightsâ€�. What is that spiritual foundation? Read the first half of that third sentence (â€œThat to secure these rights, Governments are instituted among Men, . . . .â€�). Whatâ€™s it mean? It means that the primary purpose of government as envisioned by our Founders was to â€œsecureâ€� to each and every man, woman and even unborn child, their God-given, unalienable Rights. Even if we were too ignorant, lazy or incapacitated to know what our God-given, unalienable Rights were, our government was supposed to nevertheless â€œsecureâ€� those rights. For example, under the Declaration itâ€™s clear that our God-given, unalienable Rights attach as an attribute of a creationâ€”not as an attribute of our â€œbirthâ€� (as found in the 14th Amendment). There is passage in the book of Jeremiah where our Father YHWH Elohiym declares that He knew Jeremiah long before Jeremiah was even in his motherâ€™s womb. Implication? We were created by our Creator long before we were conceived by the joinder of a sperm and ovum in our motherâ€™s womb. Thus, our unalienable Rights may have attached to us before we were even â€œconceivedâ€� in this life. But even if our creation did not precede our conception, our creation is certainly no later than our conception. Thus, under the Declaration, even the unborn have the God-given, unalienable Rights to Life, Liberty and the pursuit of Happiness. Under the Declaration, abortion is an abomination, a criminal act committed against an (unborn) sovereign. On the other hand, under the 14th Amendment of A.D. 1868 (â€œAll persons born or naturalized in the United States and subject to the jurisdiction thereof are citizens of the United States and of the state wherein they reside.â€�), our civil rights do not attach until we are â€œbornâ€�. Result? Itâ€™s legal to abort the unborn because they are not deemed to have yet received their civil (secular/political) right to life. Under the Declaration of A.D. 1776, our unalienable Right to Life attaches as an attribute of our creation and therefore abortion would be illegal. I.e, because the governmentâ€™s primary duty is to â€œsecureâ€� the unalienable Rights to all, the government would have to prevent abortion even though the unborn was too ignorant and weak to claim its own right to life. Similarly, under the two principles of the Declaration (1â€”we receive our most important rights from God; and 2â€”governmentâ€™s primary duty is to secure those God-given rights), our government is obligated to secure our God-given rights even if we are too dumb, lazy, ignorant or apathetic to secure them for ourselves. This obligation probably underlies the term â€œland of the freeâ€� in that our government was obligated to secure our rights even if we didnâ€™t know how to do it ourselves. Today, the situation is much reversed. Government will not secure any of our rights unless we are 1) sufficiently intelligent, knowledgeable and forceful to compel government to do so; or 2) sufficiently wealthy to afford to hire a very high quality lawyer. Today, if you want any rights you must fight for them. Insofar as our nation has forgotten our foundation principle (that we are endowed by our Creator with certain unalienable Rights), we have become subject to the principle of might makes right. In todayâ€™s system, if youâ€™re strong enough, smart enough, rich enough or corrupt enough, you can â€œhave it allâ€�. If youâ€™re not that strong, smart, rich or corrupt, youâ€™ll be a subject/victim or, at best, a victim-in-waiting. The persistent omissions by President Obama that Matt described in his email tell me that references to our â€œCreatorâ€� and our â€œunalienable Rightsâ€� strike fear into the gov-coâ€™s heart. These persistent omissions confirm an observation Iâ€™ve understood with increasing clarity for at least 15 years: at bottom, our struggle for liberty and against tyranny is not a secular or political conflictâ€”it is a manifestation of a spiritual war thatâ€™s been ongoing for several thousands of years. President Obama is no dummy. If ordinary men fail to mention the â€œCreatorâ€� or â€œunalienable Rights,â€� we might dismiss those failures as a consequence of laziness, ignorance, or low intellect. However, Obamaâ€™s persistent refusal to recognize the â€œCreatorâ€� and/or â€œunalienable Rightsâ€� tells me that he understands the spiritual war and isnâ€™t about to remind people of their God-given, unalienable Rights. Obama surely recognizes the spiritual war and is working for the the â€œother sideâ€�. (What a damnable fool, hmm?) That is, he wants to strip this country of its spiritual foundation. He is arguably a Muslim, an atheist, or perhaps even a satanist. But, whatever he is, he is certainly not cut from the Protestant faith that laid this countryâ€™s foundations. I have to admit that while I disagree with Obama on most things, I admire his intellectual integrity in this matter. He might be an atheist or a satanist or whatever, but he will not (so far) lie about the peopleâ€™s relationship to the God of the Bible. I.e., it would be easy for him to refer to our â€œCreatorâ€� or our â€œunalienable Rightsâ€� at appropriate timesâ€”and thereby avoid public controversy, whileâ€”in the backgroundâ€”he was secretly working to remove those spiritual concepts and values from our nationâ€™s foundation. In any case, Obamaâ€™s persistent refusal to reference our â€œCreatorâ€� and/or â€œunalienable Rightsâ€� confirms 1) my growing awareness over the past 15 years of ongoing spiritual warfare; and 2) the need to learn and rely on the weapons of spiritual warfare in our struggle against our governmentâ€™s growing tyranny. I therefore want to do whatever I can to understand and properly claim my God-given, â€œunalienable Rightsâ€�. There can be no denial that the unalienable Rights declared in our Declaration in A.D. 1776 were recognized by the government when the Bill of Rights was ratified in A.D. 1791. For more insight, read the relevant sections of the Revised Statutes of the United States of A.D. 1875 (see, Statutes at Large, 43rd Congress, 1st Session, Volume 18, Part 1 A.D. 1873 starting with â€œTHE ORGANIC LAW OF THE UNITED STATES OF AMERICAâ€� at http://memory.loc.gov/cgi-bin/ampage?collId=llsl&fileName=018/llsl018.db&recNum=16) and read/copy the following 56 pages. Note the name: â€œTHE ORGANIC LAW OF THE UNITED STATES OF AMERICAâ€�â€”not â€œTHE ORGANIC LAW OF THE UNITED STATESâ€�. The organic law of the â€œUnited Statesâ€� (federal government) is The Constitution of the United States. However, that Constitution (plus three other documents) comprise The Organic Law of The United States of America. Implication? The â€œUnited Statesâ€� is merely a component or agency of The United States of America. The 56 pages of Statutes at Large are evidence that The Organic Law of The United States of America includes four documents: 1) â€œDeclaration of Independenceâ€� (A.D. 1776); 2) Articles of Confederation (A.D. 1781); 3) Northwest Ordinance (A.D. 1787); and 4) The Constitution of the United States (ratified by the People in A.D. 1789). There is no indication in these 56 pages that any one of the first three documents were repealed by the last document (the Constitution). The â€œDeclaration of Independenceâ€� is every bit as much the LAW today as is the Constitution. Thus, properly argued and supported by evidence, I have a constitutionally-secured right to claim the God-given, unalienable Rights declared in the Declaration. 6) Under the 9th Amendment, the courts/government are obligated to recognize and perhaps even â€œsecureâ€� my God-given, unalienable Rights. I am convinced that the God-given, unalienable Rights are the spiritual/political foundation for the people of The United States of America to be recognized as individual sovereigns. Therefore, ifâ€”under the 9th Amendmentâ€”I can compel gov-co to recognize any of my â€œunalienable Rights,â€� I may be able to compel gov-co to recognize me as an individual sovereign. That recognition as â€œsovereignâ€� is the â€œholy grailâ€� of the legal reform movement. IF you can cause the gov-co to recognize you as an individual sovereign, you will have achieved real Liberty and as high a political stature as is available to any living man. Henry, King of England, duke of Normandy and Aquitaine, and earl of Anjou, to all his liegemen, English, Norman, Welsh and Scotch, and to all the nations under his dominion, greeting. When these letters shall come into your hands, know ye, that we have received Diarmait, Prince of Leinster, into the bosom of our grace and benevolence. Wherefore, whosoever, in the ample extent of all our territories, shall be willing to assist in restoring that prince, as our vassal and liegeman, let such person know, that we do hereby grant to him our licence and favour for the said undertaking. By 1167 MacMurrough had obtained the services of Maurice Fitz Gerald and later persuaded Fitz Gerald's cousin, Rhys ap Gruffydd Prince of Deheubarth, to release another cousin, Fitz Gerald's half-brother Robert Fitz-Stephen, from captivity to take part in the expedition. Most importantly MacMurrough obtained the support of the Earl of Pembroke Richard de Clare who, like his father, was commonly known by his nickname Strongbow. The first Norman knight to land in Ireland was Richard fitz Godbert de Roche in 1167, but it was not until 1169 that the main body of Norman, Welsh and Flemish forces landed in Wexford. Within a short time Leinster was conquered, Waterford and Dublin were under Diarmait's control. Strongbow married Diarmait's daughter, Aoife, and was named as heir to the Kingdom of Leinster. This latter development caused consternation to Henry II, who feared the establishment of a rival Norman state in Ireland. Accordingly, he resolved to visit Leinster to establish his authority. Before leaving Ireland in April, 1172, Henry II granted to Hugh de Lacy, one of his followers, the province of Meath (from the Shannon to the sea) and appointed him constable of Dublin and justiciar (i.e. representative of the royal government in Ireland as a whole). Within a few months Hugh de Lacy treacherously killed Tiernan O'Rourke in the course of a parley, effectivey reducing Irish resistance in Meath. It was not however until 1175 that he and Strongbow finally controlled Irish resistance within their vast liberties, allowing the land to be shared out among their chief vassals. By 1175 the Treaty of Windsor recognized Ruairi O'Connor as high-king of Ireland outside Leinster, Meath and the area around Waterford. In return Henry demanded tribute from the Irish chiefs. Ruairi's followers touted the treaty as a diplomatic triumph, but its significance dwindled quickly to a guarantee of immunity for only the province of Connacht, as long as tribute was paid. In 1176, after repeated rebellions against both O'Connor and the Normans, the O'Brien king of Thomond burned the city of Limerick to prevent its being garrisoned. South Munster was filled with domestic strife among its chiefdoms. Following Strongbow's death in June, 1176, Leinster was temporarily transferred to the wardship of King Henry II, until in 1177 when he transferred all of his rights as Lord of Ireland to his youngest son, Prince John. In 1177 the newly arrived John de Courcy mounted a successful free-lance expedition into Ulaid, and ruled for a time as an independent 'Prince of Ulster.' Hugh De Lacy's charter for Meath was renewed on stricter terms, and the two Irish kingdoms in Munster (held by McCarthy and O'Brien) were speculatively granted away: Cork to Robert FitzStephen and Miles de Cogan, who took possession of 7 cantreds and exacted tribute from McCarthy for the remaining 24, and Limerick to Philip de Braose and others, who failed to conquer any land at all from O'Brien. What followed in Ireland of the late twelfth and early thirteenth centuries was a change from acquiring lordship over men to colonizing land. The founding of borough towns, castles and churches; the importing of tenants; and the increase in agriculture and commerce were among the changes brought on by the Cambro-Normans following the Invasion. The Synod of Cashel of 1172, also known as the Second Synod of Cashel,[note 1] was assembled at Cashel at the request of Henry II of England shortly after his arrival in Ireland in October 1171. The Synod sought to regulate some affairs of the Church in Ireland and to condemn some abuses, bringing the Church more into alignment with the Roman Rite. As such it can be seen as a continuation and part of the Irish church reform of the Twelfth Century, and the first synod of Cashel, the Synod of Rathbreasail and the Synod of Kells, slowly embracing the Gregorian Reforms. To which extent the Synod set directions for the relationship between the English and the Irish Church has been subject of scholarly debate. Stephen J. McCormick described the Synod as one of the most important events of this period of Irish history. Maj. Gen. Odierno addressing the international media as commander of the 4th Infantry Division (4th ID) in Kuwait, April 2003. 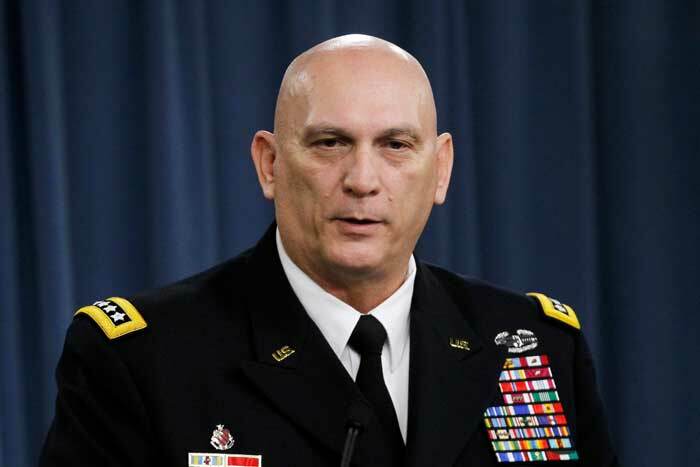 "Throughout time, our Army has been given one major mission, and that is to win our nation's wars," said Army Chief of Staff Gen. Ray Odierno. "We are not going to walk away from that, but we have to do more. We have to be able to shape other areas around the world to prevent conflict, so we don't have to go to war."